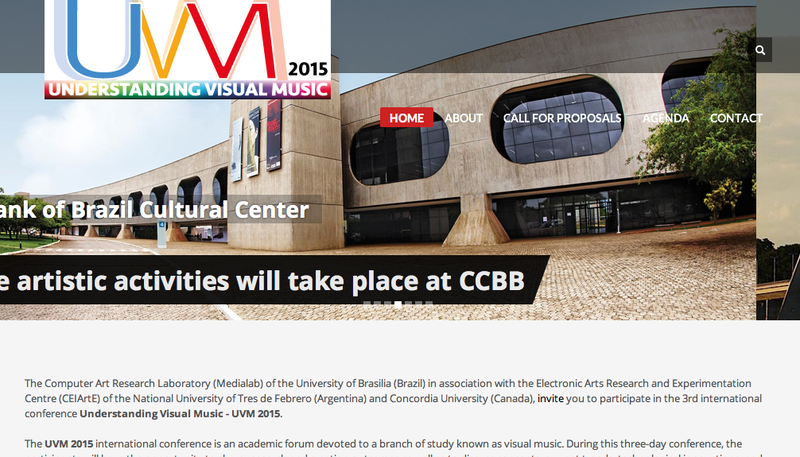 The deadline for submitting papers for this forthcoming conference on research and creation outcomes about visual music is TODAY - March 9th, 2015. DEADLINE for submissions: March 9, 2015. The Computer Art Research Laboratory of the University of Brasilia (Brazil) in association with the Electronic Arts Research and Experimentation Centre (CEIArtE) of the National University of Tres de Febrero (Argentina) and Concordia University (Canada) is pleased to invite you to submit proposals to share your research and creation outcomes as well as to discuss concepts, current trends, technological innovations and creativity aspects of visual music. "Understanding Visual Music - UVM" was born from the idea of knowing better the conceptual roots of visual-music. The first edition of UVM was held in Montreal, 2011 (http://uvm2011.hexagram.ca). In 2013 the event was hosted in Argentina (http://ceiarteuntref.edu.ar/uvm_symposium), and in 2015 Brazil will be the host of the event. "Understanding Visual Music - UVM 2015" will focus on research-creation processes and multiple relations between art, science and new technologies that are key factors in obtaining creative results when working with a universe composed of moving images and organized sound.